When Jody and I began casting about for a theme for our next project our agent suggested we do an “entertaining book.” To which I replied, “Aren’t all books supposed to be entertaining?” Ha. Ha. Thunk. The truth of the matter is that while I believe that guests ought to depart our house with a smile on their lips, a song in their heart, and a full stomach the notion of writing a how-to-entertain book left me cold. I’m old enough to remember my mother’s copies of Ladies Home Journal with their photographs of canapés marching in regimental formation across the serving platters of Bridge Night America, with Mad Men and the Viet Nam War happening just offstage. The apogee of the canapé craze was aerosal shrimp dip, a neon-orange goo you squirted onto a cracker like a miniature stupa of soft ice cream, if soft ice cream were the color of traffic cones and tasted like “shrimp.” I know, I know, I’m substituting my memory of “entertaining” for the vibrant, clever world that culinary entertaining has become. No matter, that’s how it felt to me. I prefer to worship at the altar of hospitality, rather than entertaining. Entertaining parses your life into into realms. The private realm is marked by gruel, dog food and the odd can of water chestnuts. The entertaining realm features sourdough loaves fashioned from home-grown wheat, spit-roasted French game birds and Pakistani mango tiramisu. You pull out and dust off this fancy life for visiting poobahs. As far as your guests can tell, your life is a moveable feast. Hospitality doesn’t make these distinctions. It simply invites you into my life. And this is where Sweet Pea Bruschetta with Lime Toast comes in. Bruschetta are anti-poobah food. Rough-hewn slices of toasted bread are supposed to look a little rustica–regard the macho grill marks–instead of neat and pretty. They’re often topped with something delicious (fresh mozzarella) or coolly edgy (white anchovies, baby octopus). What all of these latter things have in common is that they’re quick, easy and tasty–which conjures up the kind of private food that puts everyone at ease. Almost any time our grill’s in use, we make bruschetta, whether we’re eating en famille or not. Grilled bread rubbed with evoo and basil eliminates the need for potatoes or rice. If we are having company then bruschetta are a nice counterpoint to bowls of olives or nuts. 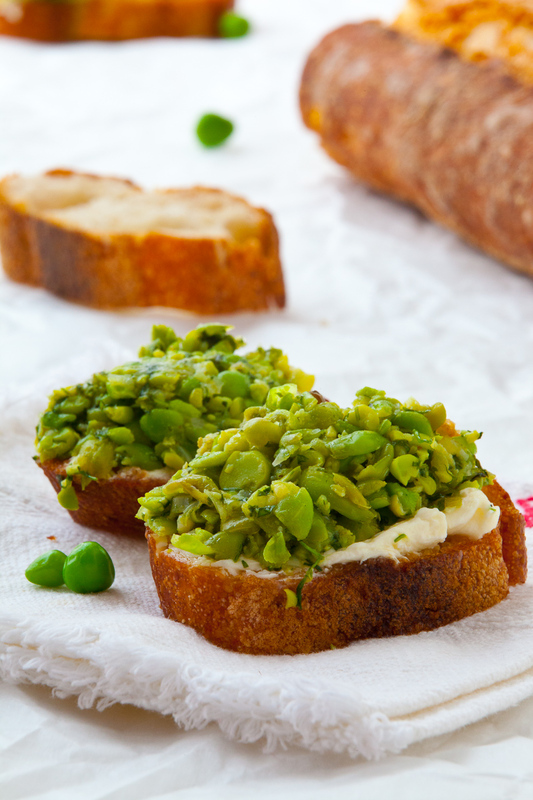 Spring peas and mascarpone? Why not? I’m not serving you anything pretentious–you just happened to drop by when we’re making a hometown favorite. And if you hadn’t knocked on our door we would have eaten all of it by ourselves. We had hoped to include some pea tendrils in this week’s post, but we only found one, mixed in with our bag of unshelled peas. Tendrils aren’t widely available yet. 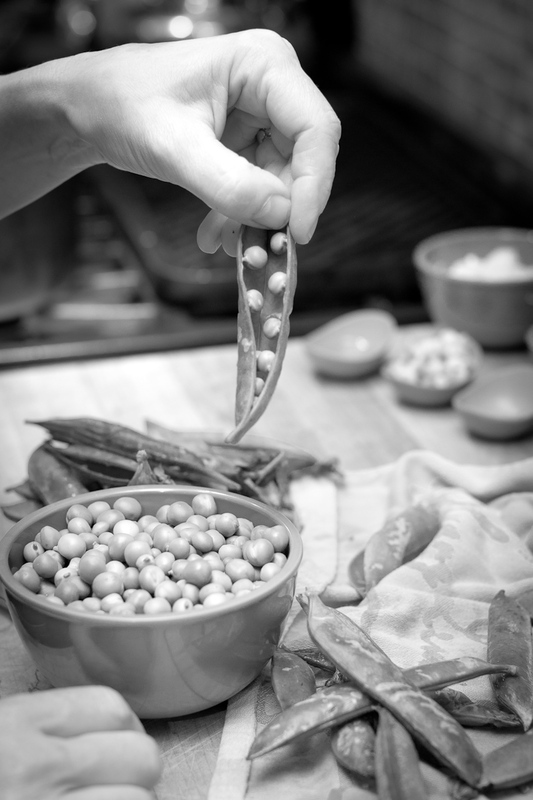 If you do happen across some, chop a few up and add them to the peas, reserving a few for a garnish. Even poobahs will be impressed. *You say bruschetta, I say crostini. Bruschetta tend to be larger and coarser than crostini, with the emphasis falling on what is rubbed across the toasted bread. 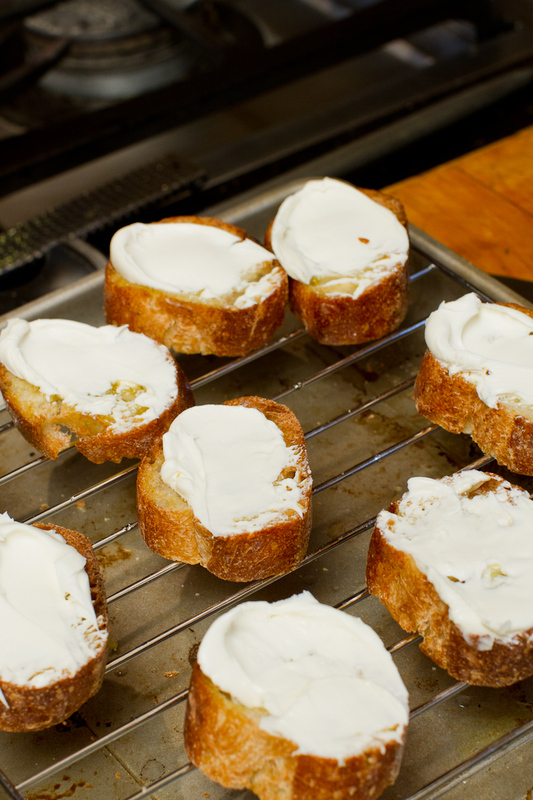 Crostini may be more delicate, and usually feature a topping. Practically speaking, the terms are used almost interchangeably. Bring a pot of salted water to a boil. 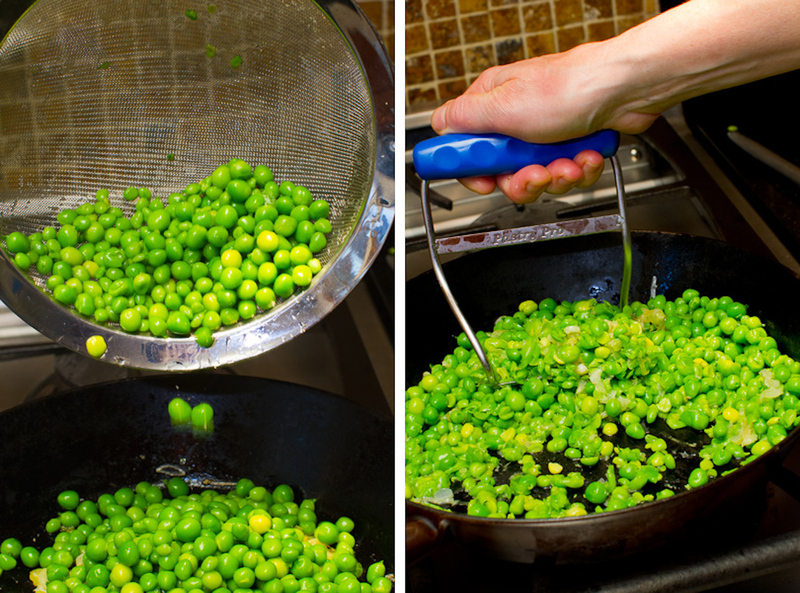 Add 2 tablespoons sugar with the peas and cook 3 minutes or until tender. Scoop out into an ice bath to cool. Drain. Heat 3 tablespoons olive oil in a sauté pan over medium heat. 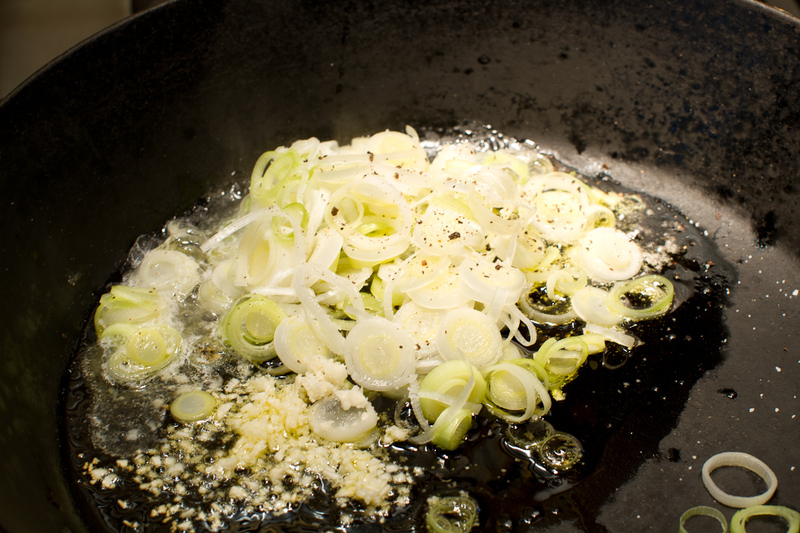 Add the leeks and garlic, season with salt and pepper, cover and cook 5 minutes, or until tender. Add the peas and smash with a potato masher. Stir in the chervil, mint, lime zest and juice of 1½ limes. Mash until well combined. Taste and adjust seasonings. Grill or toast the bread lightly so it’s crisp on the outside and still soft in the center. Brush with olive oil. Rub the toasts with the cut side of the remaining lime. Smear with mascarpone. Top with the pea mash. Drizzle with olive oil. This post should have been a no-brainer, a recipe I could do with my hands tied behind my back, but I ended up getting in my own way. When Ken and I talked about a pea bruschetta it was a simple idea, with a few simple ingredients. But was I content with simple peas and mint? Noooooo…. I started talking about it to my staff. Before I knew it I added chervil, cumin cilantro and avocado. Ken wasn’t enthusiastic–he said the flavors were muddy and the whole thing seemed a long way from simple bruschetta. So I started over with a promise to keep it simple (I kept the chervil, which I love). But there was still something missing. . . mint. There are some flavors that complete each other and with peas it’s mint. It’s that simple. 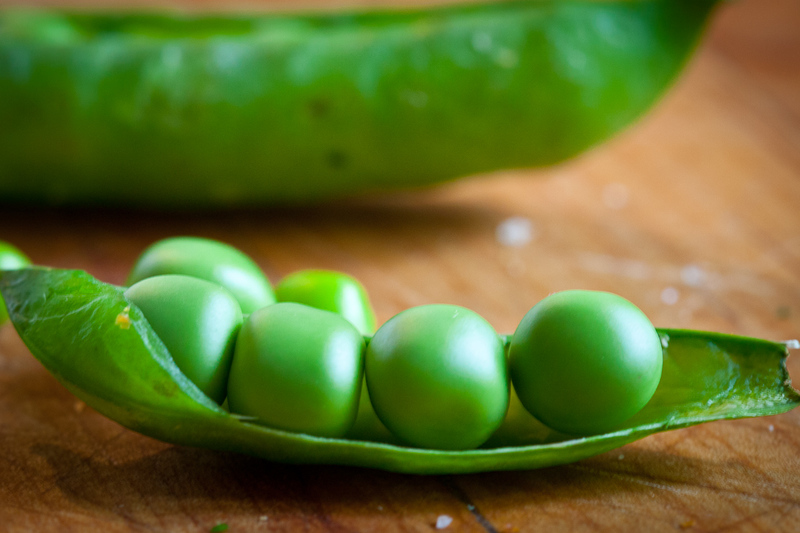 Spring peas can vary a lot in their sweetness. The first batch we used were quite starchy; the second, really sweet. I add sugar to the blanching water to cover my bases. If the peas are starchy, the sugar will sweeten them up. If they’re already sweet the sugar seems to have relatively little effect. 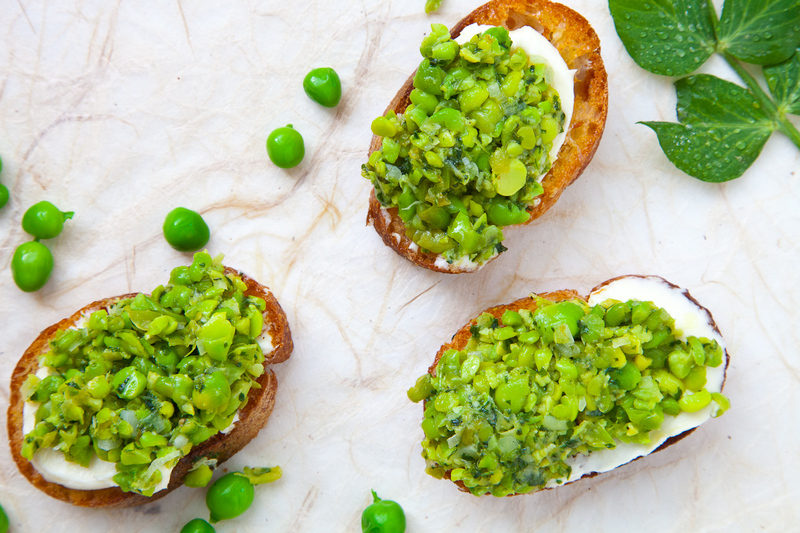 This entry was posted in Appetizer, Easy, Gluten-free, Vegetarian and tagged chervil, easy, hors d'oeuvres, lime, mascarpone, mint, peas, spring. Bookmark the permalink. I knew there was a reason I planted chervil in my garden. Nice photos, Ken. I don’t think of myself as liking peas much, but then I think about when I’ve had them fresh (vs,. from the freezer) and it’s a whole different vegetable, and totally amazing. Even pea soup from fresh peas, which is surprising as you’ve presumably cooked out any freshness, but not so! I am going to look for them at the farmer’s market today–and also see if I find any shoots, they are so pretty. I love that close up of the peas in their pod and your entertaining v. hospitality distinction. And like Sally, I’m so happy I planted chervil in my garden last week! That, and the occasional wild turkey. No peas this year, but hopefully at Copley today! Amazing photos! Inspired recipe, can’t wait to try it. 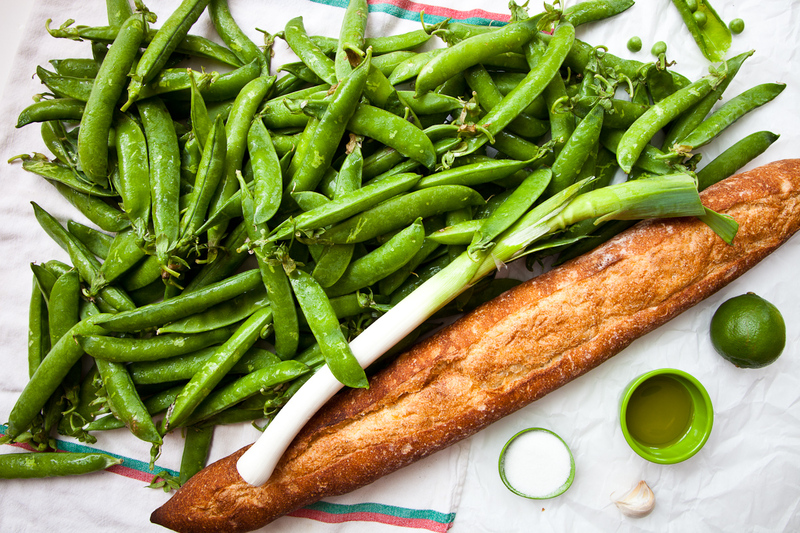 Would it be hospitable to have the guests shuck the peas? 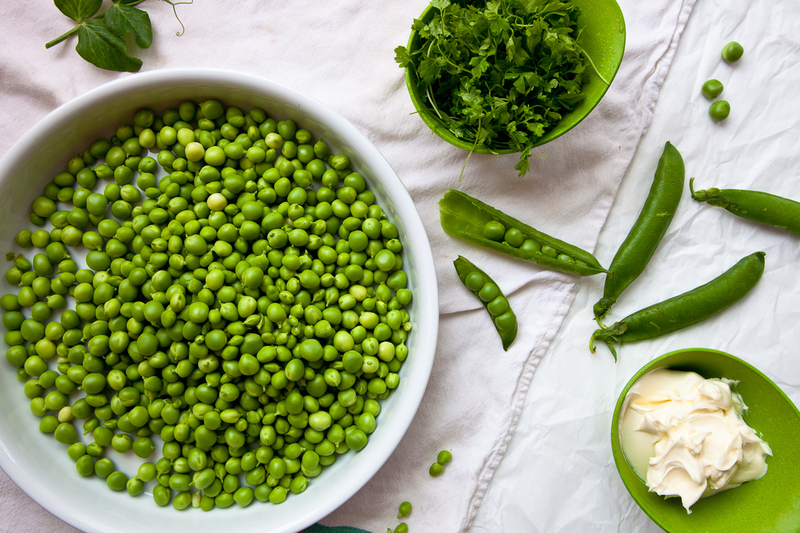 I like the pea and lime combo – a little unexpected. Yummy spring food. And to show how many ways you can change it up, I did a post last spring – crostini with pea and mint pesto, with radicchio and pistachios. It must have been a bit later in the year, as I did have pea tendrils to garnish. Oh, no worries. I know how it goes! Smoothies are great, healthy, and tasty breakfast. :) Thanks for stopping by! Such beautiful vibrant colour, I can almost taste the freshness of the dish. This looks amazingly inviting. I have never been a big fan of peas and I even used to take out the peas from “mame gohan”, literally meaning “pea rice”, a favorite of my mother’s, and just enjoy the smell and the flavor w/o having to have to eat the peas. I think at this point in my life, I can eat and enjoy the peas. This looks like Spring on a slice….I love it! Anti-Poobahs rule! Now I feel embarrassed about my peas…. I love the distinction you make between entertaining and hospitality. Do you eat dog food? Now I’m impressed and slightly unnerved.